Frequently Asked Questions – Spark! How do you choose which people and programs get on the air? We have a programming committee that reviews all program proposals submitted right here and seeks clarification when they have questions. Live Syracuse-based content will always be favored, as will non-traditional backgrounds. Past experience is irrelevant, since we do our own training. Our goal is to educate our audience with content they might otherwise never experience and your interest in that is key, as is broader community involvement. This is freeform variety programming that is mostly “alternative music” with locally-focused news and informational shows. The overwhelming emphasis is on Syracuse content in all programs, including music, produced by local volunteers passionate about what they share. We endeavor to primarily play music and air viewpoints you may not otherwise hear, but maybe should. Is this just a radio station? Not at all. Our independent media project has always used a variety of methods to fulfill our mission. Because we have a rare opportunity for legal FCC-licensed FM radio signals in Syracuse, we will be primarily focusing on that in 2017. However, we will continue to stream online during that process, expand our podcasting and social media capabilities and eventually start video production. The goal is to use all these platforms together to reach the largest and most diverse possible audience in our community. 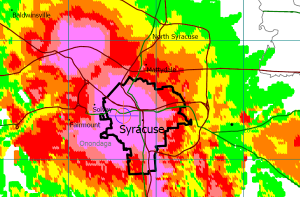 When did you start broadcasting FM signals around Syracuse? 103.3 FM started signal testing on Sunday, October 1st and 93.7 FM started signal testing later in the same week. We’ve tweaked them a lot since then but what you hear at the moment is pretty much what they can do under our current set-up. What is the radio broadcast signal and range? We currently broadcast with 100 watts on 103.3 FM from Liverpool and 55 watts on 93.7 FM from the City of Syracuse and can be heard over all of the City of Syracuse and most of the population of Onondaga County overall if you use a good receiving antenna. Can people listen besides tuning in to the FM signal? At some point in the near future, listeners will be able to connect to the webcast through this website. Some programming will be archived here as well. In the meantime, the webcast and the archive can be found here. Where can I send music to Spark!? For the time being, local music should be mailed to: Spark! 103.3 + 93.7 FM, 118 Julian Place #148, Syracuse NY 13210 or sent as digital files via email to: music [at] sparksyracuse.org. Non-local music should ONLY be sent as digital files because of our limited physical space — thanks! Will there be the potential for live performances on the air? Yes! While we currently have very limited studio space best suited to acoustic music, in the past we have found ways to incorporate a wider range of live music and intend to continue that into the future. We also will be covering live performances and events around town as we broaden our capacity. Spark! 103.3 + 93.7 FM is owned and operated by Syracuse Community Radio, Inc., which is a local 501(c)(3) non-profit educational organization under the authority of the Board of Regents of the Department of Education of New York State. Our mission has always been educational and non-profit. We raise funds through a combination of donations, fund raising events and grants, mostly. We also intend to use underwriting in the future, though not heavily. Our intention is to keep our overhead low so we can keep our creative freedom high. Why is it called “Spark!”? We wanted something that could easily and quickly convey our goals and mission. We want to spark discussion of local music, art and issues between neighbors, friends, co-workers and fellow citizens. Our goal is to inject energy and enthusiasm into the local media environment. And we also like the idea that a small spark can lead to bigger things. We chose WSPJ as our radio station call letters because more obvious choices like WSPK and WSPQ weren’t available. This map should give you a good idea. Your reception may vary based on elevation and nearby structures. Feel free to contact us at: info [at] sparksyracuse.org — thanks!